Since we rely on the feet for mobility, leg, foot and ankle surgeries are often daunting for patients. Images of being stranded in bed — unable to get to the bathroom, get up to make a sandwich, drive or attend any special engagements we’ve planned — immediately come to mind. Our NYC podiatrists explain foot surgery recovery in great detail to our patients because we want them to have a realistic idea of what the coming weeks will entail. Crutches, for instance, are much harder to use than one would think because they require a great deal of upper body strength. In some cases, we recommend a pre-surgery exercise routine that involves upper body strength training. Of course, there is also new technology available that can make life a lot easier post-surgery. Just ask Harrison Ford! Harrison Ford Injury: What Happened? Veteran actor Harrison Ford has a reputation for being notoriously clumsy. Describing himself as “a battered old Ford,” the actor has always preferred to do his own stunts so that the action looks more believable for viewers. Back in the early nineties, he damaged ligaments in his leg while filming “The Fugitive,” which later required surgery. During the “Indiana Jones” filming, Ford injured a ligament in his knee and came down with dysentery. While filming the second “Indiana Jones,” he ruptured two discs in his spine riding elephants. More recently, the 72-year-old sent Star Wars fans into a tizzy when the door of the Millennium Falcon fell on him on set, causing a leg injury that would delay production by two weeks. Rumors circulated that Ford could be out for as long as six months. Yet, The Huffington Post reports that by late July, he was walking without a crutch and wearing just a bandage on his ankle. After being treated at John Radcliffe Hospital in Oxford and spending a month in recovery, Ford is apparently almost ready to get back to work as filming has been scheduled to resume again in the coming weeks. Meanwhile, Ford is out living life: he was just spotted hurtling down a 2,500-foot Alpine Slide while vacationing with his family in Jackson Hole, Wyoming. It wasn’t long after the accident that the actor was spotted outside a posh London restaurant, dressed to the nines — with the use of a strange “peg leg.” The NY Daily News reports that Harrison Ford was, in fact, using a hands-free crutch. Even though he is walking unassisted now, he brings the crutch around with him just in case he wishes to remove weight from his lower leg, foot, and ankle. While hands-free crutches are not just for the young and athletic, a good candidate would have strong knees. “It looks very unstable, but… it’s a very short learning curve [and] people do very well with it,” explained Dr. John Kennedy, a foot and ankle specialist at the Hospital for Special Surgery. At The Center for Podiatric Care & Sports Medicine, we’ve set people up with hands-free crutches to aid in the recovery of below-the-knee injuries. 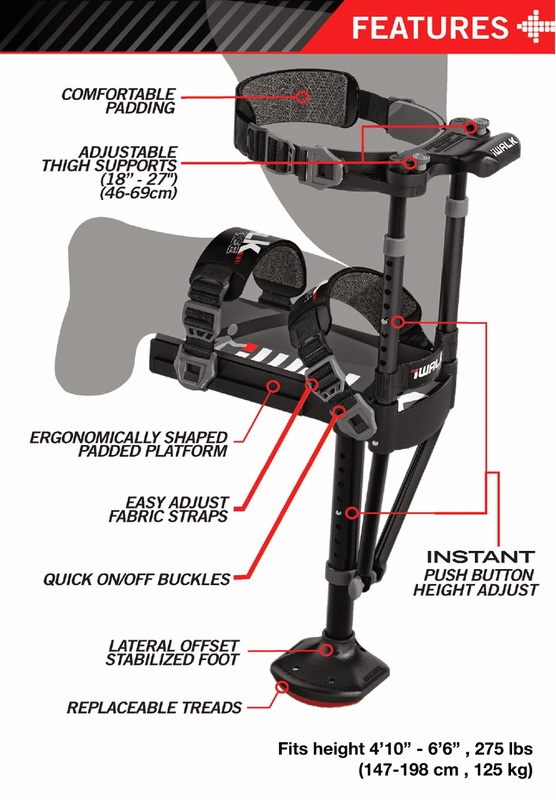 Our goal is to get you back on your feet without the shoulder and arm pain that often accompanies crutch use. Harrison Ford seemed to be using the iWalk 2.0 crutch, but the FlexLeg crutch is essentially the same thing. The crutch is strapped to the thigh, with the leg resting at a 90-degree angle, thus freeing both hands. Most people will use a crutch like this for four to six weeks, showering with it on and taking it off when they sleep. For more information on lower limb surgery and recovery options, book a consultation with our experienced podiatric surgeons.